Wilson, NC Bojangles'® Tands, Inc. Store #8 - Bojangles'® / Tands, Inc.
Wilson, NC Bojangles’® is a great place to go with family and friends to enjoy a fast, delicious meal. Wilson, NC loves the southern-style menu at Bojangles, with items like fried chicken dinners, biscuits made fresh from scratch, and flavorful fixin’s like our Cajun Pintos® and Dirty Rice®. And since we open early and serve breakfast, lunch and dinner, any time of the day is Bo Time! 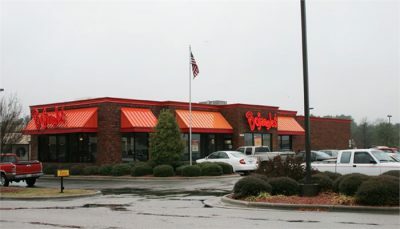 The Bojangles’® in Wilson, NC is located on Parkwood Blvd adjacent to the Parkwood Mall. Do some shopping and then stop to fill up at Bojangles’®! We love being a part of the great Wilson, NC community and Bojangles’® always looks forward to the fun and excitement of the annual Wilson Whirligig Festival. We hope to see you at our Wilson, NC Bojangles’®!